Yikes, if you live in Boston or the Northeast, the words being tossed around by meteorologists in your area include: blizzard, potential historic snow amounts (what??) and storm. My first thought was, Yes Snow Day! I get to work from home tomorrow and maybe even Wednesday, sweet, I’ll take it. I felt like a kid back in school when school was cancelled. I am certain not everyone feels the same way as I do, so while you are prepping for the storm getting snow shovels, salt, food and water, why not throw in there some whisky, it is definitely guaranteed to keep you warm and make you happy, at least I think so. 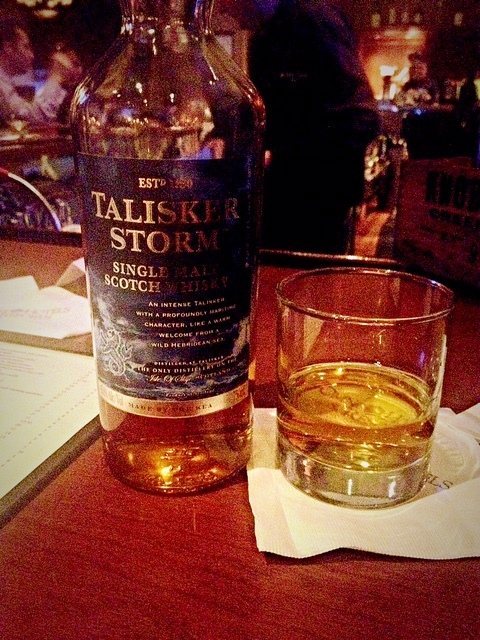 With that in mind, there is no better whisky to write about on a stormy day other than, Talisker Storm. Seems fitting for today’s blog post. This is not the first time I’ve written about Talisker. Other Talisker blog posts include: Talisker 10-year-old (priced around $55-$65) and Talisker Distillers Edition – Distilled in 2002 and bottled in 2013 (priced around $65-$75). If you haven’t read those posts, the Talisker distillery is located on the Isle of Skye and it’s the only distillery on the Island. They’ve been distilling for over 175 year and their whisky is always double distilled. It is a no age statement whisky and if you’ve had Talisker before then you know it is a smoky whisky. This range however turns up the notch on the smoke. This whisky may be a no age statement but it is beautifully made. There is balance and harmony between all the notes. I absolutely enjoyed every bit of this dram and yes; it’s a bottle I would definitely consider adding to my collection. Searching for costs on this bottle I saw them priced between $65-$70. I do recommend trying this whisky if you have not tried it before, especially if you like a smoky dram. PS: If you are like me waiting for this storm to hit, please be safe and do keep warm. Previous Post Jameson 18 year-old Limited Reserve.